A contingent of almost 200 firefighting personnel from Australia and New Zealand have headed to the US, to be deployed in California and its neighbouring states Oregon and Washington. The team of 188 personnel includes fire management specialists and helicopter support. Australia, as well as a number of other countries, has offered ongoing support to US firefighting authorities; the Australian deployment is a response to a specific request from the US based on the range of skills offered. It includes firefighters also from Victoria, Queensland and South Australia. The request was made to Australia by the National Multi-Agency Coordination Group in the US, which is co-ordinating the efforts of several emergency response agencies, including the Department of Forestry and Fire Protection (CalFire). The current US fire season has been exacerbated by excessively dry and hot weather conditions, resulting in intense fire fronts and dangerously low percentages of fire containment. More than 100 large fires were burning across 14 states and almost 582,000 hectares of ground has been lost, according to the National Interagency Fire Centre. In addition to California, there are currently major fires burning in Alaska, Arizona, Colorado, Florida, Idaho, Montana, Nevada, New Mexico, Oklahoma, Oregon, Utah, Washington and Wyoming. CalFire's public information officer Jonathan Cox said the blazes were larger in scale and burning at speeds previously unseen. "What we're seeing in California right now is more destructive, larger fires burning at rates that we have historically never seen," Mr Cox said. California Governor Jerry Brown said the wildfire season was the "new normal" for the state. To illustrate his point, Brown told US media the state had already spent more than a quarter of the budget allocated for resources across the entire annual fire season in the month of July alone. "We're going to have more fire, more destructive fire, [and] more billions that will have to be spent on it," Brown said. "All that is the new normal that we will have to face." 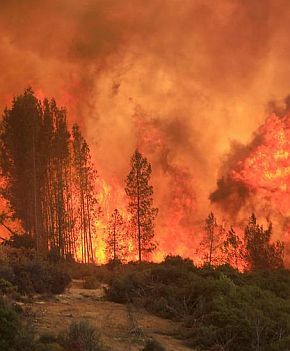 Weather agencies report that the current burst of fires came off the back of record-setting July temperatures; in northern California, for example, July temperatures were as much as 10 degree Fahrenheit higher than normal. The hotter, dryer season means that when fires start they are burning longer, burning at higher temperatures because of an excessive surface fuel supply and are more difficult to approach and contain. For further information on the deployment of local fire-fighters click here and here.